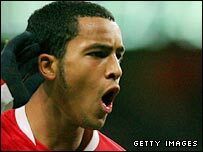 Theo Walcott scored a lucky equaliser as Arsenal held Tottenham in the first leg of their Carling Cup semi-final. The ball rebounded off Walcott's body following Young-Pyo Lee's tackle and looped over Spurs keeper Radek Cerny. Jermaine Jenas had put Tottenham in front, slotting home into virtually an empty net after Robbie Keane selflessly played him in with a square ball. Spurs were the better side and Lukasz Fabianski made several good saves while Steed Malbranque missed from 14 yards. It was a tough break for Spurs when Walcott equalised after the visiting team had created most of the decent openings. Even so, Spurs might still have won the tie but substitute Jermain Defoe smashed the ball wide after Aaron Lennon played him in. The result means that Tottenham's long wait for a victory over their north London rivals continues - their last came in November 1999 - but it leaves them well placed in the tie with the next leg at White Hart Lane. Why do Tottenham have absolutely no luck against Arsenal? In truth, it was a below-par performance by an Arsenal team comprised of a sprinkling of first-team regulars and talented youngsters. The smooth, incisive football for which Arsene Wenger's team are so often heralded was largely absent on an evening when Tottenham seemed more fluid and dangerous in possession. But the Gunners demonstrated the resilience that has ensured they have remained unbeaten at home all season by finding what appeared to be an unlikely equaliser. Arsenal had fashioned the first real opening, with Radek Cerny, preferred in goal to Paul Robinson, making an athletic save to parry a header from Nicklas Bendtner. But Tottenham had shown early signs that they could unlock the Arsenal defence and created several good chances before taking the lead. Jamie O'Hara struck a free-kick narrowly wide, Malbranque shot wide from 14 yards and then missed the target with a header while the sublime Dimitar Berbatov, at the heart of so many impressive moves, forced Fabianski into a decent stop with a low-range strike. Malbranque's first chance in particular was an excellent opportunity from which he should have scored. The ball broke to him after Keane was dispossessed and the French midfielder had time to pick his spot but instead drilled the ball wide. Tottenham scored the goal that their superiority deserved after 37 minutes when Berbatov played Keane through down the left and the striker passed for Jenas to tap home. Jenas had another strike on target before a half-time break that must have been more welcome for the home team than Tottenham. The visitors continued to hold a good shape after the interval and might have been gifted a second goal when Fabianski spilled a corner but thankfully for him the ball fell to one of his team-mates. Keane drilled a shot wide as Tottenham pushed for a second. The midfield became increasingly congested as Arsenal came back into the match and, after a relatively open first hour, decent openings were at a premium. But Walcott scored his team's goal in front of watching England coach Fabio Capello after collecting Eduardo's though ball. Replays suggested the ball hit Walcott on the hand but it all happened so quickly it would have been harsh to penalise the Arsenal forward. Arsenal: Fabianski, Justin Hoyte, Djourou (Sagna 46), Senderos, Traore, Walcott (Randall 90), Denilson, Silva, Diaby, Van Persie (Eduardo 46), Bendtner. Subs Not Used: Mannone, Gavin Hoyte. Tottenham: Cerny, Chimbonda, Dawson, King, Lee, Lennon, Jenas, O'Hara, Malbranque (Boateng 77), Berbatov, Keane (Defoe 83). Subs Not Used: Robinson, Stalteri, Taarabt. BBC Sport Player Rater man of the match: Tottenham's Dimitar Berbatov 8.02 (on 90 minutes).